The browns are back in steelhead alley and were not talking about the Cleveland Browns either! In years past, many Lake Erie steelheader’s would head north to the Western NY tributaries of Lake Ontario (such as 18 Mile Creek, Johnson Creek, Sandy Creek or the Oak Orchard River) to find brown trout action. This legendary fall run of “butter belly” brown’s has attracted trophy brown hunters from around the country for years, with fish averaging 7 to 10 pounds and a trophy of 15 pounds not out of the question. This all changed in 2002 when the NY Department of Environmental Conservation (NYDEC) started stocking the Lake Erie shoreline (NY portion) with a domesticated, inland strain of brown trout from their Rome, NY hatchery. That initial planting included 25,000 yearling browns and was primarily geared to impact Lake Erie boat fishing. These browns not only showed good survival and growth rates but started fall spawning runs into numerous Western NY tributaries of Lake Erie (including Chautauqua and Canadaway Creeks) complementing the already excellent tributary steelhead fishing. Ranging 5-6 pounds, these lake-run browns average smaller in size than their Lake Ontario cousins (whose grow rates, sizes and age are benefited by a deeper, colder Lake Ontario). The yearly NYDEC stocking target for browns in Lake Erie is now 45,000 fish with 38,530 yearling brown trout stocked by the NYDEC in Lake Erie in the spring of 2014 (between Barcelona Harbor, Dunkirk Harbor, the lower reaches of Cattaraugus Creek and Lake Erie’s Point Breeze Marina). (A surplus of 5,000 fall fingerling brown trout were stocked in the lower reach of Cattaraugus Creek in November of 2014). The Pennsylvania Fish & Boat Commission (PF&BC) began stocking browns in the shoreline and Pennsylvania tributaries of Lake Erie in the early 80’s but discontinued the program as the steelhead stocking program took off in the early 90’s. In 2009, due to increased requests for lake-run browns by tributary anglers, boat anglers and charter boat captains, the PF&BC and local sportsman’s cooperative nurseries, collaborated to resurrect the Pennsylvania brown trout program in the heart of steelhead alley. These new brown trout plantings replaced the surplus steelhead stocked by the PF&BC since the elimination of the Coho salmon program in 2003 (bringing down yearly steelhead stockings from 1.1 million to 1 million in the Pennsylvania tributaries). The first Pennsylvania stocking of 87,000 yearling browns (8 inch size) was done in 2009 by the PF&BC and 3CU Trout Association at the mouths of a select number of Lake Erie nursery tributaries. From 2010 to 2014 the stockings numbers averaged 72,000 browns. The PF&BC’s annual target brown stocking in Lake Erie is approximately 100,000 fish (unforeseen events such as a 2012 hatchery INP infection at the Corry State Fish Hatchery that can affect yearly stocking numbers). From the inception of this program, the PF&BC has been using certified/disease-free, fertilized brown trout eggs obtained from the NYDEC (Rome Hatchery Strain). The PF&BC’s protocol now after raising their allotment of brown trout eggs (received from NY) is to raise them to fry size at the Linesville, PA fish hatchery and turn them over to various cooperative nurseries including the 3CU. The nurseries then raise them to 1½ year olds and usually stock them in early May along the Lake Erie shoreline. Since it is believed that juvenile brown trout do not “imprint” in a tributary like a steelhead, it is not critical they be stocked in a specific tributary. Brown trout stocked in the spring by the cooperative nurseries are bigger (and have better survivability and growth rates) than fall planted fish (which is when the PF&BC typically stocked the browns in the past). This strategy seems to be paying off based on recent fish surveys and catches (see below). The following fall, some of these spring stocked fish will return as 2 year old males (equivalent to steelhead “jacks”) along with older browns (3 and 4 year-olds) from previous stockings. During a recent steelhead brood stock assessment at Trout Run nursery waters by the PF&BC (November 2014) brown trout were also examined and had length modalities (groupings) of 11-17”, 20”, 20-24” and 29”. An open lake gill net assessment of Lake Trout by the PF&BC (August 2014) also collected data on brown trout. It showed and average size of 6.9 lbs. (no jacks examined), with the largest brown at 15.9 lbs/31.6”. The 2014 PF&BC’s Angler Award Program showed four of the top five browns caught in the state were caught on Lake Erie tributaries (all over 10 lbs. and all caught on flies) with the largest brownie an impressive 16 lbs., 6oz. taken out of Erie’s 16 Mile Creek last November. Fly Fisher’s specifically targeting steelhead alley browns in the fall should expect the bulk of the run in late October into November with most browns spawning in November. A few browns can linger on in the tribs as late as January. 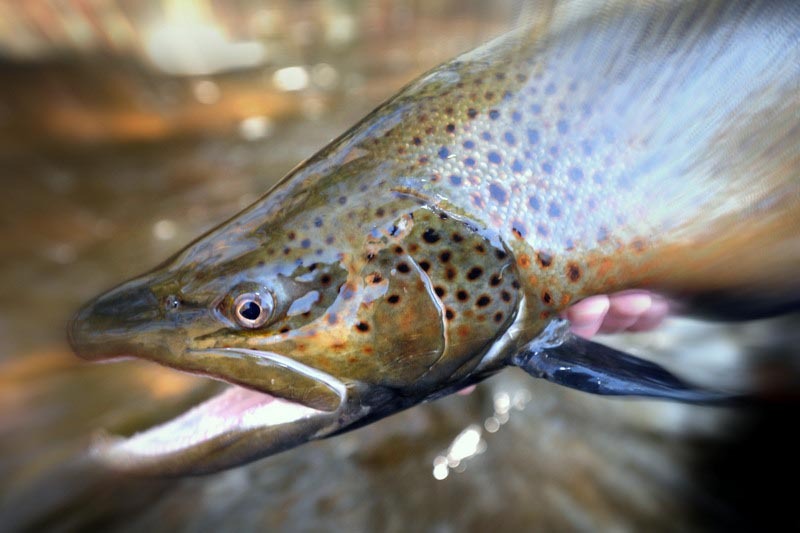 Prime Pennsylvania tributaries include Crooked, Elk, Walnut, 12, 16 and 20 Mile Creeks. Tributary fall-run brown trout are on a spawning run and are looking for ideal spawning habitat. They locate similar to spawning spring steelhead although but prefer to be less visible and seek fast runs, riffles and pocket water areas that have good current flow and depth for concealment. Browns will also use stained water flows for cover in shallow to medium water flows. Unlike steelhead, brown trout do not run far up a tributary and usually don’t go past initial obstructions like waterfalls, low level dams or high gradient chute areas. Some browns may not run very far at all and stay in and around the tributary mouth. Also fall browns when hooked rarely jump unlike their acrobatic steelhead brethren. With this in mind, browns should be targeted in the lower ends of the tributaries (the first series of runs, riffles or pocket water off the lake), below the first waterfall or chute area before the lake, at the tributary creek mouth and along the lakeshore. As discussed earlier, when browns enter a tributary they quickly locate spawning habitat. These areas also provide a great food source for pre-spawn browns (who are still in a feeding mode) and they will actively take drifting nymphs and tributary minnows while positioning themselves there. Round Goby patterns work well on Lake Erie browns since they actively feed on them when in the Lake. 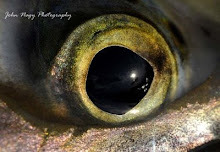 (Lake Erie browns tend to be bottom and structure oriented when in the lake and target Lake Erie’s prolific round goby populations, which like to sit on the lake bottom). Steelhead on the other hand prefer to feed further up in the water column where rainbow smelt and emerald shiners are more prevalent. If earlier arriving salmon are around, which is very common on the Lake Ontario tributaries in the fall but to a lesser extent on the Erie tribs (see below) pre-spawn browns will locate below the salmon redds and feed on drifting salmon eggs and any dislodged nymphs from spawning salmon. Try to dead-drift egg patterns closer to the streambed and a little slower than nymphs since salmon eggs (which are denser than water) sink faster than nymphs and tend to roll along the bottom. The steelhead alley tributaries can get a very small number of salmon in the fall. These wild fish are descendants of salmon stocked years ago in the lake by various fishery departments. They can include coho, chinook and even an occasional pink salmon. Last fall (2014) was an exception though with a descent run of fall cohos on the Pennsylvania Lake Erie tributaries (the PF&BC is unsure of the source of these fish). Spawning browns are very territorial and aggressive when on their spawning beds, with male browns constantly jousting/fighting for spawning rights with females. If spawning salmon are around they will aggressively chase them off their redds by nipping at their tails. Any fall-run steelhead around (which are holding/resting on their upstream movement) will also be chased away by the browns. Streamers, wooly buggers and baitfish patterns which incorporate lots of movement in their design (using materials like marabou, rabbit, temple dog, rhea, ostrich), can induce territorial strikes from spawning browns when dead-drifted through the redds. More aggressive presentations also work well when browns are on their redds. Dangling a streamer, wooly bugger or baitfish pattern just above spawning browns (as well as salmon) capitalizes on their territorial behavior and can trigger crushing strikes. Fly patterns to use on Lake Erie browns should be geared toward both the predatory and territorial response. Both steelhead and trout patterns are very effective. 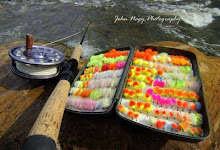 These include half-n-half, clown egg, glo bug, sucker spawn and crystal meth patterns, stonefly, fly formerly known as prince, hare’s ear and green caddis larvae nymph patterns, soft hackles, spey flies, leeches, wooly buggers, intruders and temple dog flies, round goby, emerald shiner and sculpin baitfish patterns. Classic NY brown trout patterns like nuclear roe bugs, estaz eggs, Stothard carpet flies, scrambled eggs and baby rainbow and brown trout streamers will also work on Lake Erie browns. Sight fishing is a common scenario for spawning browns (having polarized sunglasses is a must). Watch your drifting egg, nymph or streamer carefully and set the hook when you visually see the brown take. Post-spawn browns (late November into winter) are exhausted from spawning and relocate to slower runs and pool tail-out’s as well as undercut banks and log jams (where they switch back to a feeding mode). They are not as aggressive and somewhat lethargic (which becomes more the case as the tributary temperatures drop) but will take dead-drifted nymph, egg and small streamer patterns. On bigger water like Cattaraugus Creek in NY, swinging presentations for post-spawn browns will also work; just don’t expect any bone jarring strikes. If anything it will be a “short strike”, with the browns taking small bites at the fly as it is swung down-and-across in front of them. Wait a bit after the initial strike, and then set the hook when you sense the fish has struck deeper into the fly. 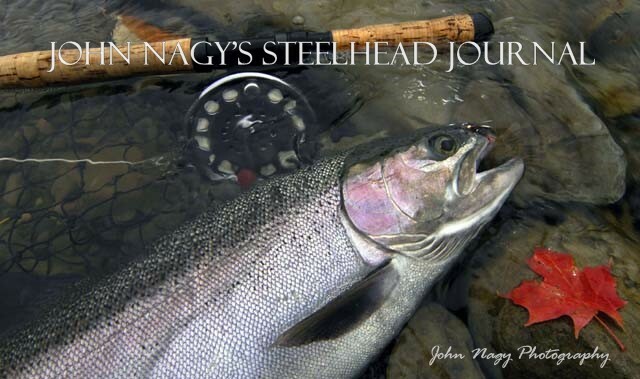 More detailed information on steelhead alley fly fishing can be found in John Nagy's classic book "Steelhead Guide, Fly Fishing Techniques and Strategies for Lake Erie Steelheading". His new "Steelheader's Journal" makes a great companion book to the Steelhead Guide. Both books are available by going to the right menu bar.